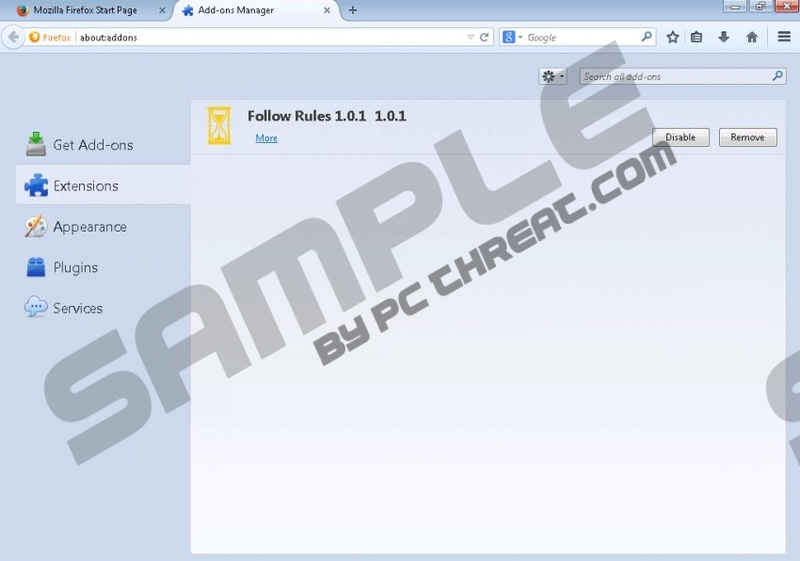 Follow Rules is a common adware application that users often do not even notice at first. This program functions as a browser extension, and it can be easily installed on Mozilla Firefox, Google Chrome, and Internet Explorer. Our security experts recommend removing Follow Rules from your computer because this program is highly vulnerable to third-party exploitation. If Follow Rules gets misused by cyber criminals, it is very likely that sooner or later you will be redirected to corrupted websites, and it could even result in a malware infection. Thus, the sooner you uninstall Follow Rules, the better. As far as Follow Rules’ origins are concerned, we know exactly where this application is coming from. It is a new addition to the SuperWeb family, and Follow Rules does not differ much from Solution Real, Dynamo Combo, Optical Surf, and many other previously released applications. One of the best ways to tell that all of them are part of the SuperWeb group is to take a look at their homepages. Follow Rules shares the same homepage design and layout as its predecessors. However, clicking the green “Start Now!” button on the website would not lead you anywhere. You will only see a blank new tab and no download will be initiated. How does Follow Rules enter your computer, then? Well, Follow Rules employs the distribution method that is very common among adware programs: It travels in software packages that are available for download from third-party websites. In other words, users often do not even realize that they install this adware application on their computers because they do not even consider a possibility. On the other hand, it is really easy to see that you have Follow Rules on-board. For one, the application adds an entry in the list of installed programs, and it also creates an extension on your default browser. However, our security specialists note that Follow Rules does not work on the newer Google Chrome versions, as the browser successfully blocks it. With this extension on Mozilla Firefox or Internet Explorer, Follow Rules can collect information on what websites you visit, and later on display tailored pop-up ads. Usually, these ads are more annoying than dangerous, but you should not tolerate them. Keep in mind that Follow Rules ads could be used by cyber criminals as the program does not review what kind of content gets embedded into its ads. Consequently, if you are not careful, clicking Follow Rules ads could lead you to dangerous sites that host more adware and sometimes even malware. Hence, remove Follow Rules from your computer right now. When you have uninstalled the program, scan your computer with the SpyHunter free scanner because you need to check whether your system is absolutely clean and safe. Open Uninstall a program and remove Follow Rules. Select Uninstall a program and remove Follow Rules. Access Add or remove programs and uninstall Follow Rules. Quick & tested solution for Follow Rules removal.